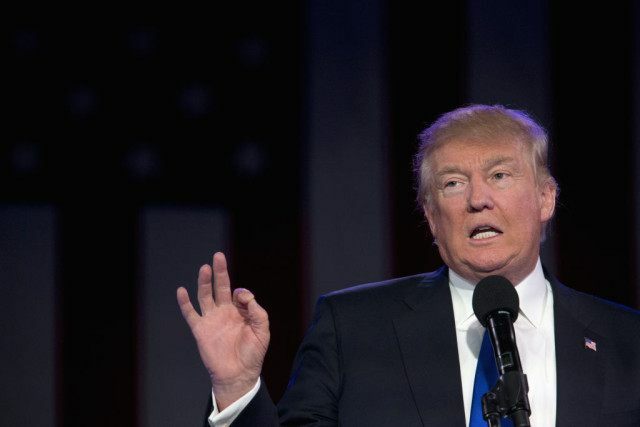 WASHINGTON (AP) — Ask Americans about bad manners in the 2016 presidential campaign and the conversation shifts immediately to Donald Trump, the GOP front-runner who has branded his critics, “little,” ”lyin,” ”low-energy” and worse. When it comes to rudeness in 2016 politics, the Republican presidential contest wins in a landslide, a new poll by the Associated Press-NORC Center for Public Affairs Research has found. The survey shows that 78 percent of Americans, including most Republicans, see the GOP race as discourteous. Only about half as many — 41 percent — say the same about the Democratic campaign. Eight in 10 people say remarks about race or gender and sexuality are unacceptable in public places, and that political leaders should be held to a higher standard of behavior than other people. It’s not just politics. Nearly three-quarters say people in general are ruder these days than 20 or 30 years ago, a finding similar to one seen in an Associated Press/Ipsos poll taken in 2005. Even so, two-thirds see political campaigns this year as outdoing the public in levels of rudeness. Trump plainly has played a role in setting the tone to extra-coarse, doling out put-downs to a wide selection of critics, political opponents, a religious group, debate moderators and protesters. Former GOP candidate Jeb Bush was “low energy.” Onetime GOP hopeful Marco Rubio was “little Marco.” Ted Cruz, who is Trump’s most prominent rival for the nomination, is “lyin Ted.” Famously, Trump said Fox News Channel’s Megyn Kelly had “blood coming out of her wherever” after she pressed him last year on his insults of women. Manners matter to Americans. Florida’s Rubio learned how little they appreciate discourtesy on the campaign trail when he returned Trump’s insults in kind, lost his home state primary in Florida and dropped out of the contest. Rubio said he regretted adopting Trump’s technique. Now, there’s evidence that Trump may have gotten the message as he struggles to add to a following that could leave him short of the 1,237 delegates he needs to win the GOP presidential nomination. He’s hired professional political operatives to steer him in the delegate derby. He was reported to have met with Kelly this week, after months of tweeted insults and his boycotting a Fox debate earlier this year. There are deep cultural roots to Americans’ dislike of rudeness in their leaders. The poll found that in general, the public disapproves of behavior ranging from using cellphones in restaurants to making sexist statements in public. Most people find vulgar language and bigoted comments inappropriate. More than 80 percent say remarks and jokes about race or about gender and sexuality are unacceptable. There is less condemnation for these types of comments made in private, but more than 6 in 10 regard them as improper there as well. Half the public see this year’s campaign for the Republican nomination as mostly rude and disrespectful, and an additional 29 percent consider it somewhat so. Even 8 in 10 Republicans (79 percent) regard their party’s process to determine a nominee for president as ill-mannered. In contrast, only 16 percent say the campaign between the Democratic candidates for president is mostly rude and disrespectful, while 25 percent who consider it somewhat so. Trump likes to dismiss complaints about his manners as “political correctness.” The poll found that only 15 percent believe candidates should not be sensitive to the possibility of upsetting other people. The AP-NORC poll of 1,004 adults was conducted March 17-21 using a sample drawn from NORC’s probability-based AmeriSpeak panel, which is designed to be representative of the U.S. population. The margin of sampling error for all respondents is plus or minus 3.8 percentage points. Follow Laurie Kellman on Twitter at http://www.twitter.com/APLaurieKellman and Emily Swanson at http://www.twitter.com/EL_Swan.